I use my computer for a variety of professional and personal desktop publishing tasks. I prepare issues of monthly newsletters for our church and for my daughter's preschool. Announcements of users group meetings, catalogs of my programs, tutorials on program usage, articles for magazines, our annual family newsletter, flyers, birthday invitations: All of these documents pass through my computer on the way to my Hewlett Packard Deskjet printer. MichTron's recent release, Fleet Street Publisher 2.0, is well suited to general publishing needs of this kind, and it provides a number of eye-catching effects to attract the attention of readers. MichTron supplies the program on three double-sided disks. (If you have only single-sided drives, contact MichTron before ordering.) The disks contain the publishing program, some clip art in .IMG format and printer drivers to support a variety of printers, including Hewlett Packard laser printers and the Atari SLM804, PostScript devices, Star, C. Itoh and Epson printers. The disks provide separate programs to install a printer driver, to strip control codes from ASCII files and to convert various types of picture files to .IMG format for use in your documents. Also included is a 265-page manual; the manual is spiral-bound, so keeping it open to a particular page while your hands are occupied with the mouse and keyboard is no problem. It is easy to learn to use the program by following the accompanying manual. The documentation is well organized and simple to use. 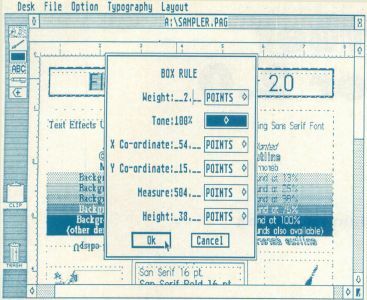 A number of sections on general desktop publishing are provided, including a glossary of computing and publishing terms, hints on publication production and suggestions on techniques to enhance your documents. Strangely, two chapters are titled "Introduction"; the first helps you set up your disks and provides cursory information on the program's options, and the second, which is actually the main chapter of the manual, explores those options in detail and offers more comprehensive information about special features and techniques. A "Guided Tour" leads you through the process of developing a document on the screen. The tour is well designed; it requires that you try all of the basic features of the program. 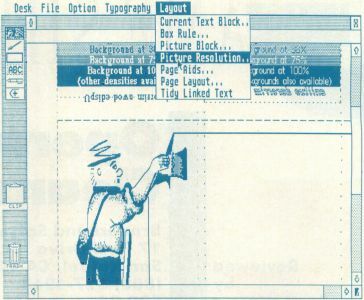 Other sections of the book provide information on using the art conversion utility, a listing of Fleet Street's character set, pictures of the included clip-art images, a listing of keyboard macros, a discussion of GEM and PostScript Fonts and instructions for customizing the default settings used by the program. The weakest link in the documentation is the index. It was rather obviously prepared by machine ("Face" and "Faces" are two separate entries, for example), and numerous opportunities for subentries have been missed. Some of the information in the body of the manual suffers because it is too general, but this is largely compensated by explicit walk-throughs and examples. The program is much too full-featured to be self-explanatory, so taking the guided tour is an excellent idea. Although Fleet Street is a complicated program, through careful and deliberate use of consistent methods for handling both text and graphics the programmers have come up with an interface that is very easy to use. Once you are familiar with the basic functions of the program it is easy to predict how an untried feature will work, even if you don't consult the manual. After taking the guided tour, which required half an hour, I was familiar enough with the basic features to prepare documents of my own. Fleet Street's screen has a GEM menu at the top with the headings Desk, File, Option, Typography and Layout. A total of 44 options are available under these headings (not counting the Desk menu, of course), and clicking most of these options will call up a dialog box in which a myriad of further choices can be made. The program allows the user to specify so much that I cannot possibly discuss all of these options in any detail, but I will highlight many of them below. The main body of the opening screen is occupied by a text window. To the left of the window is an icon menu, a clip board and a trash can. Unlike some desktop publishing programs, Fleet Street is truly a word processor. Use of the text window facilitates the preparation of text for inclusion on a page of your document; actual pages to be printed, by contrast, are prepared in page windows. 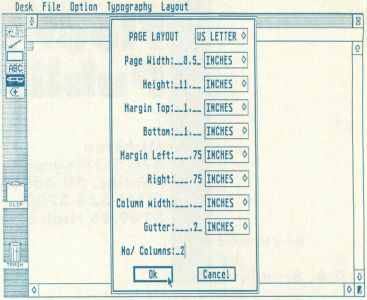 Typical word processor functions, such as search and replace, conversion to upper- or lower-case text, and the definition and manipulation of blocks of text, are available. There is a large character set; the use of accents and other diacriticals is permitted. Keyboard macros are provided for a variety of text-related functions. With the press of a key (or two, or even three), you can specify spacing, tabs, left- and right-justification, centering, etc. The program disk is prepared with function-key macros related to typefaces and text effects; these can be altered to suit your own needs. Text entry is fast in the text window, and typing directly in the program is not tedious. You can also type directly into text frames in a page window; you can hide or show any or all of the objects on the page to optimize screen redraws. Of course, you can also prepare your text with another word processor. If this is desired, you must save it as an ASCII file. The control code stripper, a desk accessory, will then prepare the file for loading into Fleet Street. The inability to import a variety of word processor formats into a document could be viewed as a deficiency; in actual usage, however, I have found that Fleet Street is a strong word processor itself. The work prepared within Fleet Street can be saved as a .TXT file for later use. Document creation takes place within page windows. Pages can be configured in all standard formats, or you can provide your own specifications. While defaults are provided, you can adjust margins, columns and gutters to suit your needs. You can choose from a variety of units of measurement for this purpose (and at all other times when measurement is required). Each page is configured separately and, when completed, is saved as a discrete unit. (According to George W. Miller, a spokesman for MichTron, a future release of Fleet Street will provide better support of multiple-page documents.) Once a page has been configured, the page window opens. Dotted lines indicate the position of the columns. The icon menu has six options for working within your document. The top icon is selected for the creation or manipulation of a graphics object. The mouse is used to draw a graphics object on the screen, and to crop, resize and move it. The program will import .IMG files into a graphics object; other picture files must first be converted to .IMG files with a separate program before use in a document. The Picture Edit icon is selected to edit a graphics object. Only limited editing (pixel by pixel drawing and erasing) is possible. The third icon allows the creation of boxes around and lines between text and graphic objects. 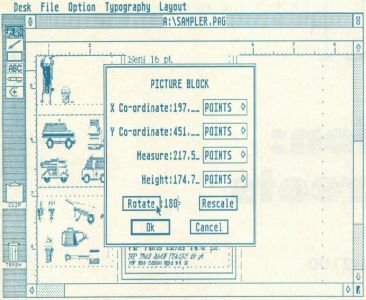 The lines and boxes are drawn in the page window with the mouse, and line thickness, shade, and position can be further adjusted using the Box Rule option of the Layout menu. Selecting the Text Block icon will allow you to create, resize, or move a frame of text; the icon below it permits text entry. The last icon turns black to indicate that a selected text window has text overflow. To move the overflow to a new text frame, simply hold down the mouse button while selecting the overflow icon, then drag it to the new frame and release it. Defined blocks of text can be stored in, or copied to, the clipboard and then dragged in the same way to the appropriate text frame when needed. Only one block can be held in the clipboard at a time. The overflow icon is useful for linking text frames on a single page; the clipboard can also be used to move or copy text to another page window. When a graphics object, line or box rule, text frame, or a defined block is unneeded; it is deleted by simply dragging it to the trash can icon with the mouse. Text can be underlined (or struck through) with the Underline option, and the user determines the weight and position of the line. One interesting option provides small caps: all the lower-case text in a defined area is automatically converted to upper-case letters of lower-case height. The program is supplied with a variety of fonts; the font package for the default (Epson) driver includes San Serif, Serif, Helga, Medieval, West End (a Deco font) and College. The fonts are available in normal and boldface, and most are provided in stair-step sizes ranging from 10pt. to 60pt. The text faces can be altered further with special effects. These include slanted, outlined, mirrored and upside-down text, or any combination of these. I had difficulty with upside-down text; occasionally, the bottom half of the text was cut off, both on the screen and in the printout. Text can be printed against a background in any of several densities of gray. The shading of the text itself can also be controlled. If no text block has been defined, a new font, font size, or typeface chosen with the Face, Size, Leading or the Special Effects options in the Typography menu will affect all of the text under and following the cursor. If a block of text has been selected, any change will affect only that block. While rotated text is not an option, you can create the same effect by saving an area of the screen as an .IMG file, which is accomplished through the Output option (this option is also selected for printing a document). I was skeptical about how effective this roundabout scheme might be, but I tried it, and the result proved impressive and simple to achieve. Once reloaded into the program as a graphics object, the text can be rotated to your specifications. Of course, it can no longer be edited, so any changes require a repetition of the process. The page window accommodates the full width of a US letter-sized document, but only one third of the height is visible. The Magnification option in the Option menu allows you to alter the level of magnification to your own specifications or, at the click of the mouse, to reduce the document so that you can see the full page (the Fit Window). The first time this option is chosen, it takes the computer a minute or so to redraw the screen. Subsequent selections of "Fit Window" bring up the display more quickly. Fleet Street's strong suit is its handling of text, but its graphics capabilities are not weak. You can specify the resolution of an imported graphic to agree with your printer's capabilities. Cropping and resizing is simple to achieve. However, when resizing an object at 300dpi, you must be prepared for a long wait. Graphics merged into the document at lower resolutions will be drawn more quickly, but they will also be much larger, sometimes so large that manipulating them into the proper size and position requires several intermediate steps. Resizing of large graphics can take several minutes. When you move up or down in a window, the graphics are redrawn; the first redraw takes considerably longer than subsequent redraws of the same object. A major complaint is the inability to import GEM files, such as Migraph's Draw Art and Scan Art pictures. The picture conversion utility will convert only Art Director, DEGAS and Neochrome files. The current release of Fleet Street Publisher does not allow text to wrap around graphics. The spokesman for MichTron has said that version 3.0 will have this ability. When using a desktop publishing program, you frequently need to access one drive or another to merge a picture or a text file. Usually, programmers will provide a default path for such accesses. Likely as not (or perhaps, more so), that default path is not the same as the one you need. When the file selector appears, you find yourself on the wrong drive or in the wrong directory, and you have to do some typing in the file-selector box in order to find your file. The programmers of Fleet Street have thoughtfully provided a Set Defaults option in the File menu. Among other things, this powerful option allows you to permanently alter the defaults used by the program. This is an especially nice feature for hard drive owners. When you boot the program after changing the defaults and saving them, the file selector will open to the right drive and directory for each task. For example, if you are loading clip art, it will open on your clip-art folder on Drive C; if you are loading text, it will open on your word-processing folder on drive D. You can also select your favorite font as the default font. The Set Defaults option also allows you to customize your printer configuration. This option is really a separate program; when you exit Set Defaults, you'll find yourself on the desktop, ready to reload Fleet Street with the new defaults saved in a file on your disk. What makes or breaks a desktop publishing program is, of course, the quality of the printout. The default printer driver worked fine with my Epson JX-80C, but elegance in printing really requires a higher degree of resolution than a 9-pin printer can provide. Unfortunately, a driver for my HP Deskjet was not included with the package. Usually, I can adapt an HP LaserJet driver for use with my printer, and this is what I ultimately did, with some degree of success: a few of the fonts will not print properly on my Deskjet, but they work well on the JX-80C. Each time a desktop publishing program is released in America, I am surprised anew that no driver is provided specifically for the Deskjet; a note in the Fleet Street support area of the MichTron RoundTable on GEnie indicates that MichTron is working on proper Deskjet support. In any case, both text and graphics printed at 300dpi, or even at 150dpi, are outstanding—crisp and elegant. Low resolution printouts on the JX-80C and the Deskjet (with Epson emulator) using the default driver produce slightly fuzzy fonts, as might be expected, and less satisfactory graphics, but the graphics can be optimized by specifying a resolution for the imported .IMG which is consistent with that of the printer. I am one of those people who rushes to print a page, only to discover that the printer isn't on or isn't filled with paper or otherwise properly prepared. In some programs, there is no way to change my mind once I click OK: I have to go ahead with the printout, even though I know it isn't going to be right, or reboot and load my document again if I can't stand to wait through the printing process. The programmers of Fleet Street must have this fools-rush-in problem, too, because they have included a graceful way to back out of a commitment to print. You can simply turn off your printer and an alert box will ask if you want to quit. You can also use the Set Defaults option to cause this alert to appear at whatever intervals you specify. Parallel and consistent operations, a well-planned manual and thoughtful enhancements for user-friendliness make Fleet Street Publisher 2.0 easy to learn and pleasant to use. The high quality and professional appearance of the printed product, the large character set, and the numerous special effects make this program a legitimate challenger in the mid-priced desktop publishing software market. I recommend it. D.A. 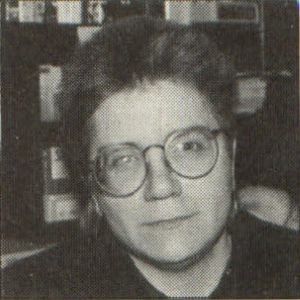 Brumleve is an ST programmer and writer living in Illinois.